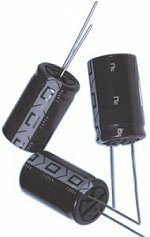 NIC Components is pleased to announce the addition of NEDU series of low ESR radial leaded electric double layer capacitors (EDLC) to its expanded EDLC capacitor products offering. The NEDU series features wide temperature operation from -40°C to +85°C (derated operation above +65°C), and is suited for use in power boost, dying grasp and system back-up applications. With high energy storage (10X ~ 100X higher than electrolytic capacitors) the NEDU series provides boost energy to power circuits during periods of high load requirements and during time periods when system power or power outage has occurred. NEDU is offered in capacitance values from 1F to 33F (1,000,000uF to 33,000,00uF), with 2.7VDC voltage rating (derated to 2.3VDC at +85°C) with high power performance advantage of low equivalent series resistance (ESR) down to 20 milli-Ohm, for high discharge current applications. Electric double layer capacitors (EDLC) have high energy storage with rapid charge - discharge characteristics which battery technologies cannot match. This makes EDLCs ideal for use as backup power sources and dying gasp circuits, as starting power for motors and drives, in power boost circuits during load stepping, as memory backup power for real time clock (RTC) circuits, and in smart metering & green power applications. NEDL series is suggested for use with NIC's NPIM_P series of metal composite shielded high current - low loss power inductors and NIC's NCLS series of precision tolerance low ohmic value metal foil on ceramic current sensing resistors.